The 33-year-old striker paid a £19.65 fine and £71.50 costs on Friday after being held shortly before Christmas. Wayne Rooney has revealed that some former England players are jealous of the Three Lions' current success. The former captain has spoken to ex-players who have struggled to grasp England's appeal after they reached the World Cup semi-finals in the summer. Rooney played in a side labelled the 'Golden Generation' who failed to live up to their potential and never got past a major quarter-final. And the country's 53-goal record scorer, who played his final game in Thursday's friendly 3-0 win over the USA, admits some retired stars cannot handle England's progress. 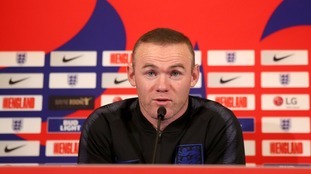 "I know there are some ex-players who I've spoken to who can't come to terms with England doing well," Rooney told several national newspapers ahead of Sunday's Nations League showdown with Croatia. "That is wrong. I'm not like that. I'm a fan now. I want England to do well. I'm proud to have played for England so many times and I always have been. "I've had my time. I'm happy with what I've contributed to the national team and I look forward now to the next few years and watching this team progress. "I've enjoyed being around Gareth (Southgate), the players, the coaching staff and seeing how it's all developing. "I wouldn't say I've got regret (over my England career). The main thing is that I can look back and say to myself I gave everything. It didn't always work. It didn't always pay off. But I have given everything when playing for England and I've tried to make us successful. "Sometimes everything just isn't enough. But no, I've got no regrets. I've had my time and it didn't quite work out in terms of trophies. I'm happy with my international career and I'll always look back and be proud of what I achieved for England." Southgate has admitted to holding back his critical review of England's performance in order to allow Rooney the send-off he deserved. The former England captain, record goalscorer and most capped outfield player brought the curtain down on his international career. Wayne Rooney spoke about the pride of his youngest child seeing him in his England shirt and reveals the last time he cried.